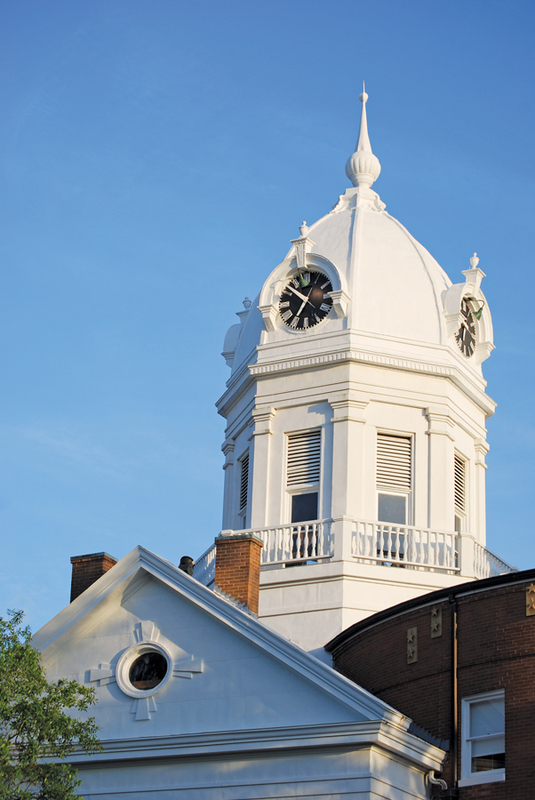 The iconic clock tower crowning the Old Monroe County Courthouse shines like a beacon, welcoming pilgrims who’ve crossed the southwest Alabama sea of cotton and corn fields, spindly pines, and flamboyant mimosa trees to walk in the footsteps of Scout and Dill, Atticus and Boo. 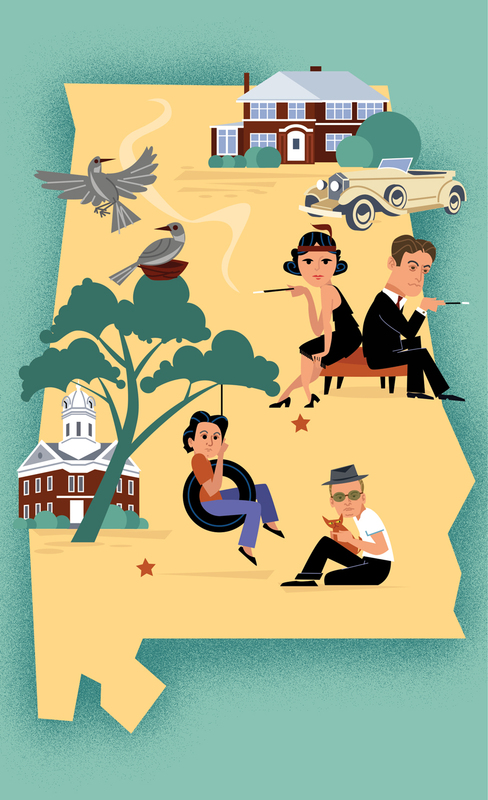 Its bright-white appearance on the horizon signals your final approach to Monroeville, the Literary Capital of Alabama and home of Harper Lee, who set her classic novel To Kill a Mockingbird in a town modeled on the Monroeville of her Depression-era childhood. Begin your visit at the redbrick courthouse on the town square. Built in 1903, the building garnered national attention in the years following the 1960 publication of To Kill a Mockingbird, and in 1991, after decades of limited use, it reopened its doors as a museum. On the first floor you’ll find a replica of a 1930s law office, as well as a great visitor information center and a large gift shop, the Bird’s Nest. Upstairs, exhibits on the book (and the 1962 film) are brought to life with audio gleaned from interviews with Lee. An adjoining exhibition spotlights another acclaimed Monroeville writer, Truman Capote. Capote spent a large part of his childhood living with his cousins in the house next door to Lee’s, and many believe Lee based the character of Dill on her childhood playmate. She also assisted her friend with research on his bestselling 1965 nonfiction novel, In Cold Blood, regarded as a masterpiece of literary journalism. illuminates the setting of some of the novel’s most memorable scenes. On your way out, pick up a walking tour map of 1930s Monroeville and stroll the surrounding streets, searching out buildings of significance to young Lee and Capote. Check out the former Monroe County Bank where Lee’s father kept a law office and the storefront that once housed Thompson’s Bakery, among Capote’s favorite stops. Stop in at Ol’ Curiosities & Book Shoppe, just a couple of blocks off the square, and splurge on a signed first edition of Go Set a Watchman, Lee’s 2015 follow-up to Mockingbird, plus collections of Capote’s short stories. End your day at Mel’s Dairy Dream, a walk-up burger and shake joint on the site of Lee’s girlhood home. Order a cone of soft-serve and take a seat on what remains of the wall that once separated Lee’s yard from Capote’s. It’s easy to imagine the pair sitting on these same sun-warmed stones some eighty years ago, admiring childhood treasures—a notched arrowhead, a gleaming cat’s eye marble, a tiny bird’s nest—and making up stories about their neighbors. It’s hard to believe those two little people would go on to change the face of American literature, one penning a book many regard as the great American novel, the other creating a groundbreaking work at the intersection of journalism and storytelling—and giving us Holly Golightly, the dazzling heroine of Capote’s 1958 novella, Breakfast at Tiffany’s. In October 1931, the couple returned to Montgomery and leased a handsome two-story clapboard house in the city’s tony Old Cloverdale neighborhood. Though they only lived in the house six months, their time in Montgomery represented one of the longest periods of stability in their dizzyingly vagabond life. In 1989, their former residence became the permanent home of the Scott and Zelda Fitzgerald Museum. As you step through the door, the tinny sounds of ragtime and vintage jazz transport you to a bygone era. Six galleries showcase family photos, newspaper clippings, personal letters, and treasured artifacts, unfurling the stories of Scott and Zelda’s lives. The first gallery chronicles the couple’s early love affair, the birth of their daughter, Scottie, and Scott’s early successes. In the Roaring Twenties room, Zelda’s flapper accessories—a beaded clutch, a feathered headband, a slender cigarette holder—trumpet the verve and abandon of the age. The neighboring gallery, titled “A Great Depression,” documents her struggles with mental illness and the failure of her only novel, Save Me the Waltz, as well as Scott’s literary disappointments and his falling-out with Ernest Hemingway.